Sri mad Bhagavad-Gita, known as the ‘Celestial song on the War-field’ is the quintessential presentation of Vedic guidance. 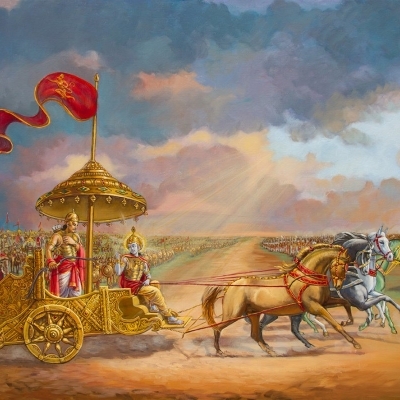 Gita, in short, is the quintessential summary of the ‘ upanishads’ – the vision and wisdom summary of Vedas. The work in 700 couplets, in 18 chapters, presented as a dialogue between Arjuna and Sri Krishna, is also a compendium of Yoga tradition.